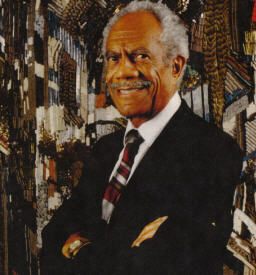 February 2, 2012 would have been the 90th birthday of Charles F. Whitten, pediatric hematologist, co-founder of the Sickle Cell Disease Association of America (SCDAA), and devoted husband, father, and grandfather. The National Library of Medicine marked the occasion by celebrating the acquisition of Dr. Whitten’s papers. This unique collection will help people better understand the contribution made by a physician, researcher and advocate who greatly advanced science, education and outreach for sickle cell disease (SCD). 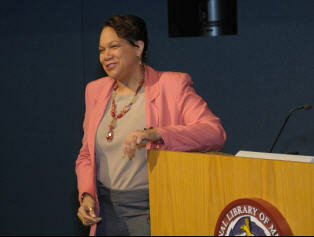 NLM Director Dr. Donald A.B. Lindberg welcomed the Whitten family, and SCDAA President and Chief Operating Officer Sonja Banks, to Lister Hill Center auditorium to hear Dr. Wanda Whitten-Shurney’s moving tribute to her father, a lecture that drew heavily on the papers and finished with a fitting personal anecdote. “On this occasion, we are able to thank the Whitten family most sincerely for the gift of the papers,” Dr. Lindberg said. This gift was first announced at the 2010 NIH James B. Herrick Symposium: Sickle Cell Disease Care and Research. The papers will be made available later this year. 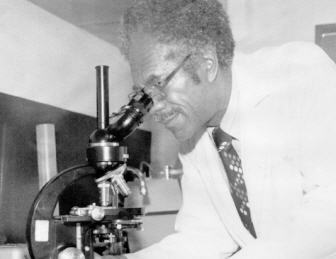 The talk, “Introducing Charles Whitten: Scientist, Humanitarian, Family Man,” illustrated, among many things, Whitten’s landmark work fighting SCD. Whitten-Shurney started the talk by admitting her struggle to cover the details of her father’s epic life in 45 minutes. “My first name is Wanda, but my last name is Dr. Whitten’s daughter,” she said. “My father was the most influential man in my life personally and professionally.” Whitten-Shurney is a pediatrician at the Comprehensive Sickle Cell Clinic at Children’s Hospital of Michigan. She also is also Chief Executive Officer and Medical Director of the Michigan Chapter of the SCDAA. Whitten did many things, for many people, in many different spheres. His work in SCD was at the forefront. In sickle cell anemia (SCA), the most common form of SCD, the body produces crescent or sickle-shaped red blood cells, resulting in anemia. The sickle cells also get stuck in blood vessels, blocking blood flow, increasing the risks of infection, and causing intensive pain and organ damage. People with SCD are born with two sickle cell genes, one from each parent. A person with sickle cell trait (SCT), or one sickle cell gene, doesn’t have the disease but can pass it on. Whitten-Shurney said her father was among the first to insist on and to develop newborn screening for SCD, which is performed in every state. She described one example that she continues to use in her own work: the Whitten Dice. “Many young black men find out they have SCT only after they have a baby with SCD,” she said. One in 12 African Americans carry the trait. Whitten developed color-coded dice to educate couples about the genetic risks. This was one of many methods developed by Whitten to promote SCD awareness. Whitten also made a lasting contribution to medical education: Wayne State University’s post baccalaureate enrichment program. “This program led to more African Americans graduating from [Wayne State] than any other medical school besides Howard and Meharry,” Whitten-Shurney said. The lecture showed a wide-ranging view of the content of the Whitten papers, including scientific publications, moving letters from former students, and photographs of his philanthropic outreach with the SCDAA, a network that included Muhammed Ali and Archbishop Desmond Tutu. The papers also tell the story of Clinique Whitten, an SCD clinic in Haiti partially funded by Whitten. The final moments of the talk were devoted to Charles Whitten, the family man. Despite all the time he spent bettering the world, Whitten was always there for his family. Among his favorite pastimes was baking chocolate cake. At the conclusion of the lecture, Whitten-Shurney paid a particularly fitting tribute to her father. She handed out a document with great personal significance to the Whitten family: the recipe for the chocolate cake her father loved to bake. With the family’s permission, we are passing it along at the bottom of this article. Sift flour, salt and soda together. Mix chocolate, butter and boiling water and stir until chocolate and better are melted (you can do this over low heat if necessary). Add sugar and mix thoroughly. Add flour mixture alternatively with sour milk beating until smooth after each addition (begin and end with flour). Add eggs, which have been beaten. The batter will be very thin. DON’T PANIC. Bake in two 9-inch pans about 20 minutes at 400 degrees. Line the bottom of the cake pans with wax paper. During the last 5 minutes, test the cake frequently with a toothpick because it should be removed from the oven immediately after the batter no longer clings to the toothpick. Or remove from the oven when you press a finger lightly on the cake’s surface and it springs back. Don’t over bake. The goal is very moist cake. Melt chocolate and butter, then add water, vanilla and sugar. Mix well. Spread the frosting between layers, top and sides. Mix corn syrup, water and butter, bring to a boil, remove from heat and add chocolate chips, mix until chips are “dissolved.” Allow the mixture to come to room temperature, then pour over cake from a height of about 1 foot. You won’t need to spread the glaze over the top with a spatula. Cover the sides with the glaze using a spatula as the glaze runs down the sides. Allow to set for 15 minutes. Cover the sides with chocolate sprinkles. March 8, 2012 in Collections, Events.